PC Tail shielded contacts provide a cost effective packag­ing solution for limited space applications where connec­tors are attached to printed circuit boards. High reliability is assured with factory pre-assembled contacts and stan­dardized termination to the board. PC Tail contacts are available for MIL-DTL-38999 Series II. 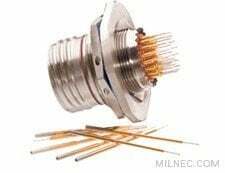 For improved performance we recommend Milnec compatible MIL-DTL-38999 Series II style connectors. Note: #22M and #22D contacts are interchangeable. Tail stickout dimensions are for Milnec connectors. When used in compatible connectors from other brands, dimensions can vary as much as ±0.10 inches due to manufacturing differences. To quickly order your 38999 connector prefilled with your preferred PC tail contacts, take your connector part number and replace the P (pin) or S (socket) with X (PC tail pin) or Y (PC tail socket) and simply add the Dash Number of the preferred contact tail length. For example to order a DS07W10-35PN with DSPT22-106 PC tail contacts, order DS07W10-35XN-106.